Description : (sans pagination) [1 l.] title , [1 l.] legend, [10 cards] pl. ; ill.: 15 phot. figs. ; 31.5 cm. Photographs : 10 albumens with 15 photomicrographs, mounted on printed boards. Photographer : Julius Grimm (1842-1906). Subject : Histology — Photomicrography. Author caption: von Fr. von Recklinghausen ; Professor an der Universität Strassburg. Co-author caption: von Dr. P. Meyer ; Assistent des path. Instituts Strassburg. Photographer caption: Mikro-photographischen Anstalt von J. Grimm. Photo captions: No. 1-10 | Mikro-photographisches Institute von J. Grimm in Offenburg. Recklinghausen was first to describe haemochromatosis (GM 3916). Recklinghausen perfected the silver nitrate process for staining interstitial cell structures, an important contribution to histological studies (Virchow's Archiv. 19, 1860 ; p. 451). Imbibation of lymph tissue with a weak silver salt solution—the first step of the Recklinghausen method—was followed by gentle agitation in a sodium chloride wash and the reductive action of sunlight. Recklinghausen discovered the endothelial lining of lymph vessels using his silver nitrate process, and described these cells in his monograph titled, Die Lymphgefässe und ihre Beziehung zum Bindegewebe (Berlin, 1862). Plate 10 gives a beautiful picture of intraductal endothelia in the tissue surrounding a breast cyst. 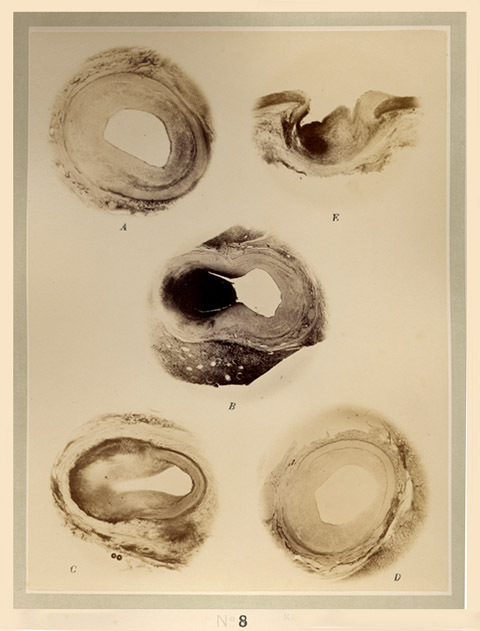 Plate 8, shown here, displays four aneurisms of small arteries in the kidney and one aneurism in a branch of the aorta (fig. E.). 200 copies of a companion work, also illustrated by Grimm's photographs, were published under the title, Zehn Tafeln Mikrophotographien nach botanischen Präparaten (Trübner, 1878). The descriptions were written by the medically trained botanist, Heinrich Anton de Bary (1831-1888), who established the science of pathophytology and served as first rector of the University of Strassburg.